ROME (AFP) - One of the final works of Zaha Hadid, the acclaimed Iraqi-British architect who died suddenly last month, was posthumously inaugurated in Italy on Monday. Inspired by an oyster, the new maritime terminal at the southern port of Salerno features a hard shell above a soft, fluid interior and the wavy lines that were Hadid’s signature. It is her first major project to come to completion since her death from a heart attack at the age of 65. 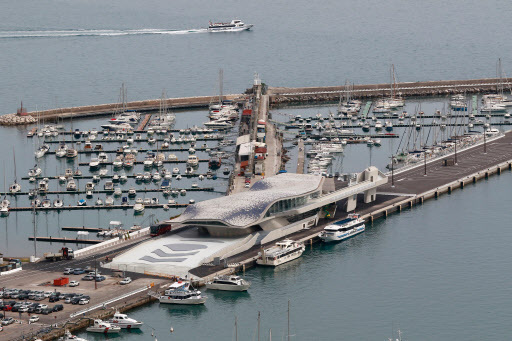 The new terminal is part of a broader redevelopment of Salerno's port area and is designed to smooth the movement of the throngs of ferry and cruise ship passengers passing through it. Italian Prime Minister Matteo Renzi visited the building on Sunday and paid tribute to Hadid’s legacy. “This extraordinary work adds to everything Salerno is doing to transform itself and I think it is marvelous,” Renzi said. “It is also a way of remembering the great architect that Zaha Hadid was." If Salerno is undergoing a transformation it is also thanks to the contribution of this architectural star. ”We should have been able to celebrate this moment together but it was not to be." Hadid's practice is now being run by German architect Patrik Schumacher, who worked alongside her for 28 years before her death. The studio had some 36 projects at the design stage or under construction when Hadid died at a hospital in Miami, where she was being treated for bronchitis. Major works in the pipeline include a 2022 World Cup stadium in Qatar, a New York skyscraper and a new parliament for Iraq.